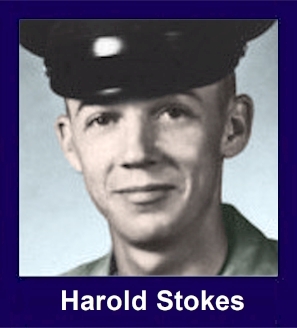 The 35th Infantry Regiment Association salutes our fallen brother, PFC Harold Dean Stokes, who died in the service of his country on February 9th, 1968 in Quang Nam Province, Vietnam. The cause of death was listed as Small Arms/AW. At the time of his death Harold was 22 years of age. He was from Gary, Indiana. Harold is honored on the Vietnam Veterans Memorial at Panel 38E, Line 61. The decorations earned by PFC Harold Dean Stokes include: the Combat Infantryman Badge, the Bronze Star with V, the Purple Heart, the National Defense Service Medal, the Vietnam Service Medal, the Vietnam Campaign Medal and the Vietnam Cross of Gallantry with Palm Unit Citation. Harold was a neighborhood friend. We played baseball and all the things little boys did. I think Harold's favorite was baseball. I didn't know Harold was drafted. I was in Viet Nam with the 101st when my mother sent the local newspaper clip of Harolds death. I remember him as being a tall, thin, handsome fella, that was liked by all the neighborhood kids. All American boy. For heroism in connection with military operations against an armed hostile force in the Republic of Vietnam. Private First Class Stokes distinguished himself while serving as an RTO with C, 1/35th Infantry. On 9 February 1968, Company C was on a search and destroy operation west of Hoi An. Private First Class Stokes' platoon was attempting to silence an enemy position from which it was receiving fire. As the platoon was maneuvering into position, it came under intense enemy fire from small arms and automatic weapons. Private First Class Stokes immediately radioed the company commander and requested gunships. Although he did not have any cover, Private First Class Stokes remained at his radio and continued to fire at the enemy. The platoon was then mortared and the enemy attempted to overrun it. During this time, he eliminated several of the enemy. When gunships came in to aid the platoon, Private First Class Stokes directed their fire and stopped the enemy from overrunning the platoon. He then found cover and continued to fire at the enemy. Again the enemy advanced on the platoon. Seeing a wounded man in the open, Private First Class Stokes attempted to drag him to cover. It was at this time that he was mortally wounded. His personal bravery, professional integrity, and devotion to duty are in keeping with the highest traditions of the military service and reflects great credit upon himself, his unit, and the United States Army.